Abstract : A leading Chinese electric machinery maker has developed and completed the runner for a million-kilowatt generating unit, the world's largest in terms of capacity. 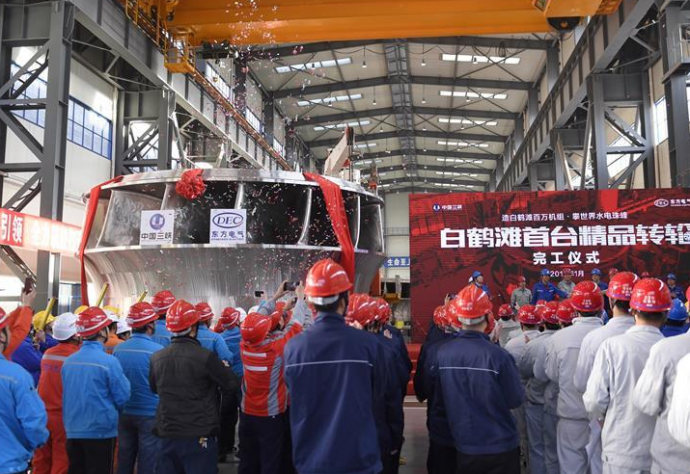 CHENGDU, Jan. 12 (Xinhua) -- A leading Chinese electric machinery maker has developed and completed the runner for a million-kilowatt generating unit, the world's largest in terms of capacity. Dongfang Electric Machinery Co., Ltd in southwest China's Sichuan Province delivered this gigantic runner, the core part of generating units, at the Baihetan hydropower station construction site on Saturday. The runner has a diameter of 8.62 meters and is 3.92 meters high. It weighs 353 tonnes. It took more than 100 technicians one year to complete the runner, seen as "the heart of power units." The maximum capacity of a hydropower generating unit stands at 800,000 kilowatts. The Baihetan hydropower station is designed to have 16 domestically-made generating units each with a million-kilowatt capacity. "It's a historic leap in the localization of our key hydropower equipment," said Zeng Xiaoping, deputy general manager of Dongfang Electric Machinery. On the Jinsha River, an upper section of the Yangtze, the Baihetan dam is the second largest after the Three Gorges project in central Hubei Province in terms of installed capacity.